So you can just imagine how mighty Dr. D's erudition on J.P. Crawford was, before Crawford became a Mariner. As it happens, lately there has been some cause for Dr. D to review a prospect list or six, and at some point recently he realized that a certain fledgling shortstop was on everybody's top 100 NOT top 100 that's top TEN (10) lists. Crawford was #4, #7, #anything in the top 10 before 2016 and 2017. Also before last year he was in everybody's top 50, usually 20. Personally, I see a very athletic, toolsy player that has yet to successfully make any adjustments to his swing, bat path, and mental approach at the advanced levels of MiLB. I see a capable, average defender, who’s athleticism allows him to handle multiple positions; however, Crawford really does not grade out as a plus defender anywhere. To me, a top prospect is a player that should immediately help and positively impact their ML team, upon their arrival at the ML level. 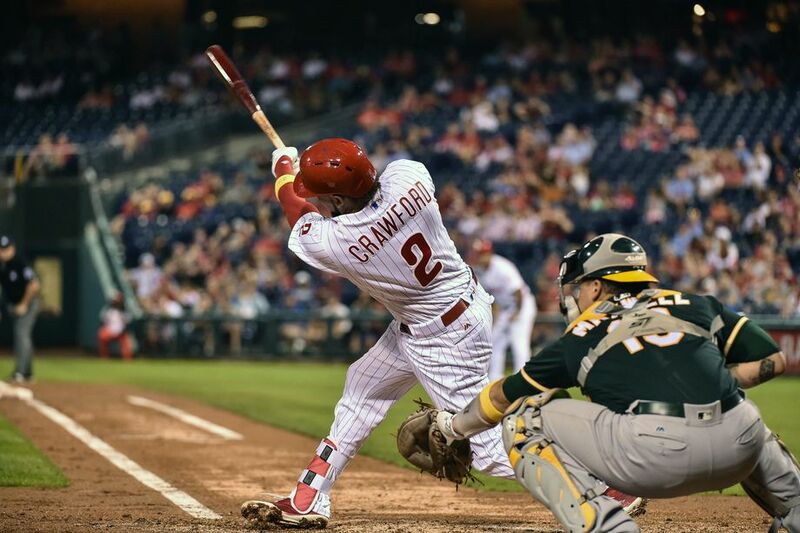 Over the past three seasons, there was never a time I once felt that way about JP Crawford. In other words, they're spitting mad that Crawford didn't give them a Corey Seager-style MVP candidate right off the bat. Crawford didn't hit three homers in his first week and slowly get hot from there. You might not be any more interested in the NL than I am, but you know all about age-arcs and what it means when a prospect makes the bigs at 22, 23 or 24. Scouting Report: All the party pieces are present for an on-base machine that plays above-average defense at the six-hole, and that’s still a star even in the days of everyone uppercutting a potentially juiced baseball. Crawford has a silky, fast swing from the left side that still projects as average-to-plus at the major-league level notwithstanding some mediocre batting averages in the high-minors. He pairs that with some of the best plate selectivity in the minors, and the combination could coalesce to post some shiny OBPs during his peak. Defensively, he’s a no-doubt shortstop with smooth, strong actions and more than enough arm for the position; he shouldn’t have any issues at second or third if the Phillies so desire, either. The two remaining tools here aren’t nothing, either. On the minus side, at age 23 in the bigs he had only a 90 OPS+ in 117 at-bats. He did not "immediately help and positively impact the Phillies" when he arrived. I think I can put two and two together, can't you? Get what? Why Dipoto would chuck Jean Segura out the car window at 75 MPH and grab a Corey Seager type who should be ready in 2020 or 2021. (Split that trade out: Nicasio and Pazos for an aging 33-year old star, and Segura-Crawford.) You might disagree. Dipoto's own opinion is clear. He thinks Crawford is a top-10 prospect. 2023 vs 2024? WHAT'S A YEAR BETWEEN FRIENDS? Well, it would be handcuffing him to the piano for 2024, is what it would be. Oh by the way it's this, and the fact that they cut Sheffield and Swanson, that lets you know Jerry's not exactly kidding when he says they're targeting 2020-21. The pitchers will only need to stay down a couple weeks, right? But stay down they will; 2019 is not the very top priority. Tim Beckham projects to 4.1 runs per 27 outs this year, per Shandler. At $1.75 million salary, he's a (very) quality placeholder. Omar Narvaez at 4.7 runs per game isn't. Between the two of them they look like a rock-solid #7-#8 in the lineup to me. EMOTICON DUSTING HANDS OFF Dept. Well, that does it for us. We've got our thoughts organized on the J.P. Crawford trade. An ML-ready blue chip shortstop who boasts a high-OBP left hand bat, in return for a minor star who's making $15M per year. So what's to see here? Looks like a cliche'd Billy Beane moneyball trade to me. I like it. I like him. ‘Nuff said. The guy has had a 100 pt Eye, wherever he has played. He can pick it. He will hit a hat full of homers. I am not particularly concerned if he K’s a bit. He’s cheap. OK, he isn’t Segura with the bat but he isn’t Segura in the locker room either. Without hard evidence, I admit, it still seems like Segura is a headache in some ways. Get J.P up here in 35 days and give him the position for 11o games or so. Don’t dink him around, the position is his, let him own it. I doubt any baseball person outside the M's expects Crawford to make it. Crawford has seen his contact rate plummet as he has climbed the ladder through the minors...even when his contact rate was higher, his batting average results have not been good. He's shown flashes of power, but his HctX and xPX have been terrible. 187 AB isn't a large MLB sample, but from what wle've seen so far, he's looked overmatched at the plate. Speed has been his best and most consistent skill, but his stolen base success rates have not been good. I think it was Shandler that coined the phrase, "once you demonstrate a skill, you own it." But what if you've never demonstrated anything? Anyway, more to the point is Segura. We all know who he is and what he can do. But do we really know who he is? Moe suggests the same thing a lot of people mull...clubhouse poison? --JD traded for him from Arizona in 2017. JD still had friends in that organization from his GM term there. If Segura were a problem, why would JD not have known about it? --JD signed Segura to a 5 year extension later that year. If Segura were a problem, why would JD give him the contract? For me, the problem is with management, not the player. After starting the season in a bad slump,1 for 25 he finished up much better with a .255/.369/.479 line. I'd take that. He hit .214/.319/.393 which, park-adjusted, gave him a 96 wRC+ or 90 OPS+. Since when is a 90 bat a washout at shortstop? SS's last year who clocked in below 96: Semien in Oakland, Brandon Crawford, Alcides Escobar, etc ... only 12 clubs had regular shortstops over that figure. Oh by the way Jean Segura had performances of 67 and 64 at ages 24 and 25. *I'm* not making Crawford's age-23 cup of coffee the be-all and end-all but if you were going to, his showing was fine. BaseballHQ calls him a "pedigreed shortstop" with some growing to do. I don't think they're based in Seattle. He'll be up in six weeks, right around there, and we're likely to have a lot of fun watching him over the next several years. There is a Dustin Ackley scenario but there is also a Jean Segura (plus) scenario. His OBP skills at a glove position make him a very high-floor player. LOL. You may be right, or I may be right--or he could wind up somewhere in the middle. Time will tell.